Are you a newly married couple? Are you searching for sweep your partner off your feet? Arrange a wonderful romantic honeymoon in Maldives and make a surprise to your new partner. 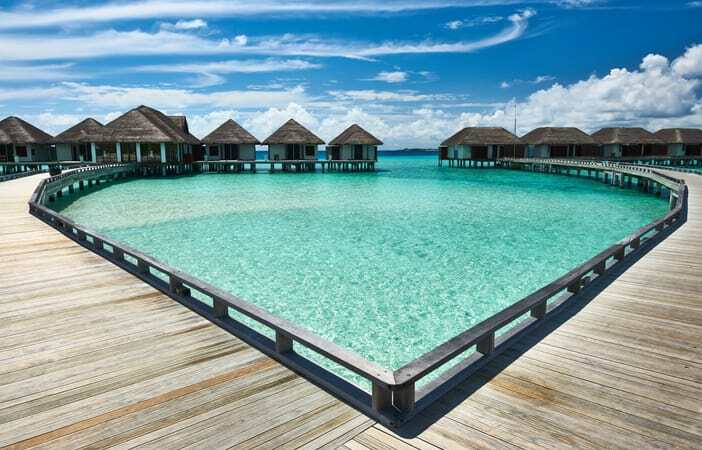 Maldives will be full of huts suspended over the azure water of Indian Ocean. It will be your dream place for honeymoon after reading to this article. Maldives will assure you the luxury days and epic time with your partner. Enjoy the sapphire water with your loved ones in the private islands where you can feel the complete peace. No need to worry about the weather in Maldives, as all the time will be convenient for honeymoon in Maldives. Spent your time with your partner along with the fabulous creatures under the ocean. Enjoy the scuba diving with your partner and realize the beauty of eye-catching coral reefs. Get pleasure from spending your valuable time on a dolphin cruise with your lovable one in the mid of Indian Ocean. Explore the magic of the Sea- Your dream of staying alone with your love comes to true while you sail on the sea to reach the admirable creatures of the sea. Here you have to start your trip at the time of sunset, which will make your night special in the mid of sea. The fabulous view of the sea will be a treat to your eyes. Also visit the deserted island of the Maldives while you are there. Are you eager to know about the honeymoon packages available to visit Maldives? Here are some packages and the hotels that included in the package. Choose the best one which suits you and plan a trip to Maldives with your lovely partner. As 99% Maldives are complete of the water, you can spend your most memorable moment of your life fully on the water. Most popular package is Maldives Private Island, and the hotel under this package is Paradise Island Resort . Best place in Maldives at very good price. Here know some interesting things about Paradise Island Resort before booking a trip to this place. It is just 9.6 km far away from airport, which is locally named as Lankanfinolhu. A life in the mid of beach is the main attraction of this resort. You will be completely surrounded by the admirable marine life. The resort will arrange sports both in land and the sea to make your honeymoon more romantic. It has become the best spot for the surfing enthusiasts. Superior Beach Bungalow- Well set for couples separately where the balcony faces the beach and you can feel the ultimate luxury in your private bungalow. Airy and light at atmosphere with the fantastic interior decorations will welcomes you and make your stay romantic. Water Villa– It is the perfect place for swimming or snorkeling adventure. Bright spacious villa within the water and the crystal clear lagoons as you step out will makes you feel relax. It will be your best accommodation in Maldives. Haven Villa and Suite- Built on the stilts directly above the water will offers you the perfect view of the Indian Ocean from your luxury rooms. Ocean Suites– Offer you the best view of the Ocean from the window of your villa. The crystal clear lagoon with the private pool around the suite will truly be an incomparable experience. The resort will arrange for the private dinner at the terrace of the villas and suites to give you the magnificent view of the Ocean where you can feel the luxury of the resort. Holiday Inn Kandooma is the hotel which is one of the best packages which is available at your budget. Kandoo tree around the resort give the name Kandooma to the resort. Just 4 minutes walk from the resort; you will reach the beach which surrounds the resort. The resort dining option will provide you the magnificent view of the Indian Ocean. The rooms are available over the water and land you can opt for your best at this resort. The best resort for those who looking for the honeymoon resort at modest budget. The 6 island villas and 30 water villas provide you the excellent service and Adam and Eve treatment (spa features) with the private champagne at your private place. It will offer you the best water sport and diving options around your villas. Luxury 5 star resort with 5 star amenities and the overwater spa become the best place in Maldives. Private plunge pool at the deck of each and every private villa gives you private feel where you know need to get outside of your villa to relax in water. Select your favorite resort and which best suits you. All the resorts given above are mostly preferred by the couples, which has excellent spas and full of water villas. Try one of the best packages according to your budget.